Experience Paradise Jet Boating's premium "Adventure Ride"... famous for its unique blend of thrills and adventure mixed with beautiful scenery and sightseeing. 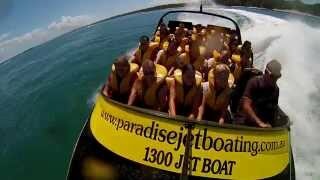 Paradise Jet Boating's premium adventure ride travels over 35 kilometres through Moreton Bay Marine Park. It's 55 minutes of 'full-on' fun and adventure mixed with wonderful scenery and sightseeing. 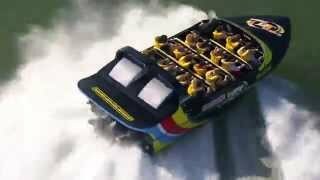 Customers enjoy 360 degree spins, high-speed drifting, power slides, beach-buzzing and other exciting manoeuvres through the beautiful, pristine waterways. Magical wild dolphin spotting and amazing waterfront mansion viewing are also part of this fantastic experience. 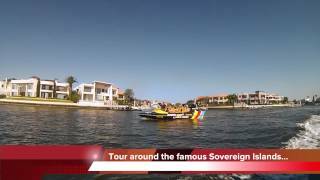 They are Australia's only jetboat tour to be certified by Eco Australia - recognising a commitment to Eco sustainability, customer safety, quality experience and great service. Offering unique "Jetcam" onboard filming systems, take your ride home on USB, show your friends and re-live your adventure! Suitable for children from only four years old, this is a 'must-do' activity for the whole family. Paradise Jet Boating's Premium Adventure rides are famous for their unique combination of thrills and adventure mixed with stunning scenery and sightseeing. 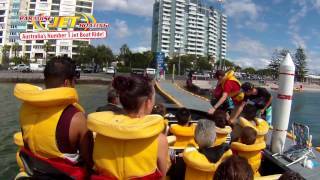 Experience 360 degree spins, high speed drifting and other exciting manoeuvres....while exploring the beautiful Gold Coast waterways. 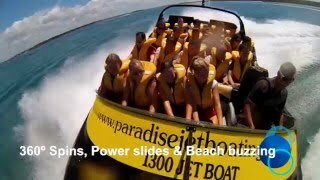 Paradise Jet Boating's premium adventure ride allows exclusive access through the protected Moreton Bay Marine Park, beautiful natural scenery, dolphin spotting and abundant other wildlife. Then enjoy a cruise around the iconic Sovereign Islands and the collection of amazing multi-million dollar mansions. Departs on the hour 11am to 4pm every day! (Earlybird Special price available for 9am and 10am departures). 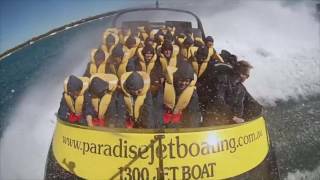 Paradise Jet Boating provides special group rates and has flexible durations and departure times. International and inbound groups are their specialty.